Liberty’s Carson Kharchla, left, looks to take down Massillon Perry’s Emil Soehnlen during the Division I championship semifinals Friday night at OSU’s Schottenstein Center. Olentangy Liberty’s Carson Kharchla doesn’t have the easiest name to say — or spell — but it’s one everyone who pays any attention to high school wrestling is becoming quite familiar with. The junior, competing in his first OHSAA Division I Individual State Wrestling Tournament, won another pair of matches Friday, the last a convincing 7-2 championship semifinal win over defending state champ Emil Soehnlen to punch a ticket to today’s 170-pound final at OSU’s Schottenstein Center. After dominating Massillon Jackson’s Tyler Tolarchyk 15-7 in Thursday’s opener, Kharchla picked up a 13-2 major decision over Cincinnati Archbishop Moeller’s Sam Wyche Friday morning before taking down Massillon Perry’s Soehnlen for the second time this season later in the day to advance to his first state final. Kharchla said he has his father, former Soviet Union Junior National Champion Miron Kharchilava, to thank for getting him where he is today. Kharchla will be taking on Medina’s Brady Chrisman in the championship … and he won’t be the only Patriot in action. Liberty’s Trevor Lawson also advanced. 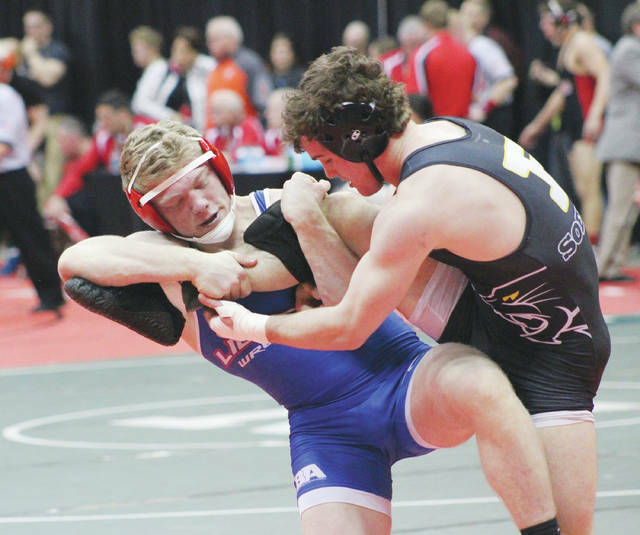 The senior maneuvered through the 182-pound bracket with an opening-round pin before knocking off Perry’s Zach Blackiston 8-4 in the quarterfinals and edging Cincinnati LaSalle’s Blake Wilson 1-0 in the semis. Today’s final against Massillon Jackson’s Victor Marcelli will be his second in three years. Lawson nabbed runner-up honors at 170 as a sophomore and third-place points in the same weight class last year. Other area standouts who lived to wrestle another day included Olentangy’s Jacob Sherman, who won a pair of consolation matches to earn the chance to finish as high as third at 113; the Braves’ Alexander Gore, who will take on Huber Heights Wayne’s Austin Mullins in today’s seventh-place match at 145; and Liberty’s Blake Saito, who will take on Brunswick’s Matt Fields in the seventh-place match at 132. The fifth and final session of the tourney, featuring the Division I, II and III championship matches, is set to start today at 5:45 p.m.